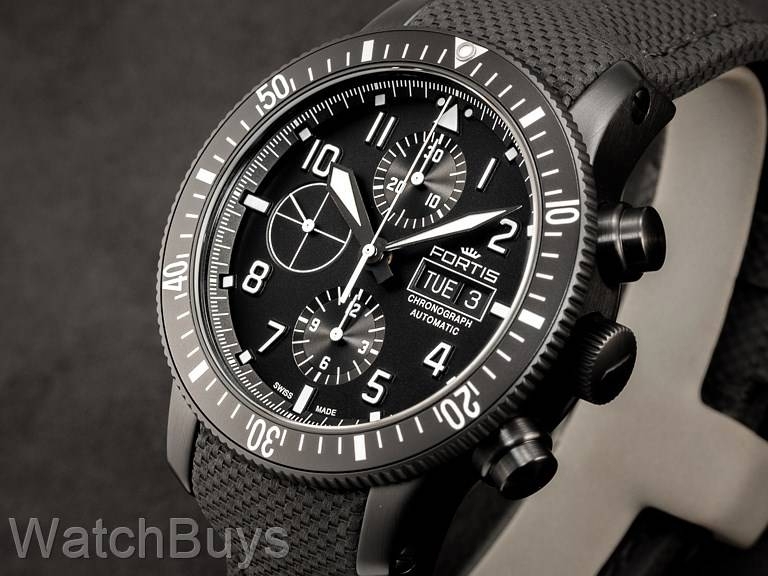 We love the two new Fortis Aviatis Aeromaster Mission Timer watches, both in all black PVD/DLC cases. This model features full chronograph functions along with time, day and date display with a rotating bezel, while the second new Mission Timer features day and date display with no chronograph. To create this new Mission Timer, Fortis started out with their most famous case, the B-42 which of course is 42 mm in diameter. This case is the black version (PVD/DLC) of the official Cosmonauts case and features the same case back embossing with the Fortis logo, Roscosmos logo and the Roscosmos Training Center logo. This case has proven superior functionality and unrivaled robustness in countless space missions over the past 25 years. Fortis spends a lot of time to get their dials right, and it shows in this watch. The numerals and indices are not simply printed on the dial but instead are applied directly into the rehaut resulting in extreme legibility and a 3D effect. The hands, numerals and indices on the new Mission Timer are coated with Superluminova that illuminates green at night. This new watch is fitted with the best strap offered by Fortis - their black performance integrated strap (mixed materials with a fabric overlay) which leaves no gap between the case and the strap and black PVD tang buckle.